Security agencies have gone into a tizzy after at least 50 computers of the Defence Research and Development Organisation were hacked by unidentified operatives. Investigating officials suspect that a spy agency is responsible for the hacking but, they say, several DRDO officers do not even bother following the standard operating procedure, making it easier for hackers to breach the security system. The probe into the hacking spree has revealed that an Indian Army official of the rank of a Major, posted in Andaman, could have, through sheer carelessness, inadvertently compromised information. This is not the first time the carelessness of an officer of the Indian military has made the job of hackers easier. Recently, the computers at a naval base of the Eastern Command were hacked and the cyber attack was facilitated by some navy officials who had not followed the standard operating procedure. The Intelligence Bureau is especially wary about hackers working for China and searching for defence documents of the Indian military. “Drills have been conducted in the past to ensure that staff members are extremely careful. But at times, some officers act casually, resulting in such incidents. They are dealing with sensitive information. At a time when we are constantly upgrading our capabilities in the cyber space, a lot needs to be done by the officers in such sensitive locations,” said the IB official. In the recent DRDO hacking case, hackers had managed to get access to at least 30 classified files. But the authorities have been trying to downplay the incident, claiming that though certain sensitive filed have been compromised, they are not all linked to national security. Some officials, despite repeated warnings, continue to browse the Internet and visit social networking sites from the very same computer in which classified information is stored. This exposes the system to a host of security risks, say cyber experts, pointing out a two-year-old case when a goof-up by an officer in a nuclear power station in Andhra Pradesh had created ripples. The officer had, despite strict security instructions, used his personal pen drive on a system which contained crucial data. The DRDO had earlier faced a cyber attack in November 2012, when Algerian hackers targeted its website as well as that of the Prime Minister’s Office. The hackers’ group, which called itself SanFour25, even defaced the websites of West Bengal police. The hackers had modified the root files of the websites to steal data. Chinese hackers, considered the most dangerous ones in cyber space, had hacked into the network of BSNL in Andhra Pradesh recently. The network was accessed by hackers, reportedly working for Chinese agencies, to secure information along India’s coastal belt. Some officials, however, claimed that Chinese telecom giant Huawei was responsible for the incident as it was trying to curtail BSNL’s expansion plans. Though India is waking up to the threat of cyber warfare, the process of awakening is too gradual, rue experts. The National Informatics Centre, which was supposed to provide e-mail IDs to top security officials and government figures, has been working at a snail’s pace. 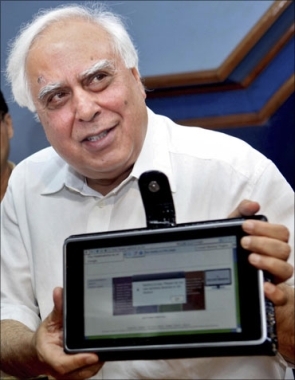 Even Union Law Minister Kapil Sibal, who is privy to some top-secret information, uses a Gmail or Hotmail ID. “Such e-mail IDs are easier to hack as their servers are not in our control. Officials and ministers who want to be tech-savvy at the cost of national security prefer to use services such as Yahoo, Hotmail or Gmail, as these are easier to configure on their smartphones. Using an NIC mail on the smartphone is not the best option since it fails to load most of the time,” said the IB official. 50 crore cyber attacks in 90 days: Android phones worst hit! India is at war, but doesn't seem to know it!